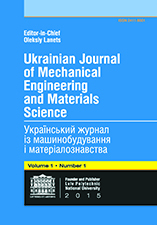 The English-language scientific periodical "Ukrainian Journal of Mechanical Engineering and Materials Science" was established for publishing the results of scientific investigations and applied research in the fields of mechanical engineering and materials science. The main goal of this journal is the exchange of scientific ideas and practical achievements of local scientists, engineers, designers, and their foreign colleagues. The wide scientific and applied orientation of the journal allows the use of this periodical as an information field for debatable discussion of new methods, theories, investigations, research, and developments at the intersection of these scientific and educational fields.